Integrated Project Management Company, Inc. (IPM) was founded in 1988 by president and CEO C. Richard Panico with the goal of building a company based on a foundation of honesty, integrity, and ethical precepts. Through analyses of projects in the public and private sectors, Rich recognized a pressing need for premier project execution across industries. He concluded that most organizations, for one reason or another, lack the ability to execute projects reliably and efficiently. He also projected that, over time, the criticality of this capability would become more pronounced. Rich saw an ever-growing need for high-performance project management, with the addition of process, discipline, and leadership to assure execution of organizations’ most critical initiatives. At IPM’s inception, project management was scarcely understood and considered an assignment by most organizations; today it is recognized as a profession. IPM derives its competitive advantage from values-driven, self-motivated, and highly skilled employees, which the company considers its most important asset. The sought-after character elements of excellence, honest and ethical conduct, and uncompromising integrity have been foundational requirements in the recruitment of IPM employees since its inception. 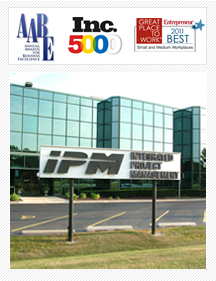 IPM’s culture of excellence ensures that employees are challenged, provided opportunities for growth, and treated fairly with respect and dignity. The award-winning culture sets the company apart from others through values-based leadership and attributes of courage, tenacity, and the ability to inspire. Integral to the core principles of the company is its self-proclaimed responsibility to its customers and society at large. IPM aims to influence the economic and political future of our country in order to preserve the positive elements of free enterprise. By extending its influence, IPM has contributed to, and continues to engage in, programs that positively influence the world.